Bringing your team to our Woodland Retreat, nestled beneath the South Downs in Hampshire, offers you a unique and exclusive base from which to build connections within your team or re-think your business strategy or leadership. A Woodland Retreat can be run in many forms, all of which will enhance your Team Building and Team Development. Please drop us an email or go to the Event Design form to let us know what you want to achieve. If you can't manage an overnight experience, you can book the site for a day or evening of activity. If you are staying over you will be sleeping on very comfortable camp beds in really nice Bell Tents. You will have the site (1/2 a mile from civilisation) completely by yourself. As you know, when your team is functioning well all sorts of magic can happen and when it is not, business stops flowing, people leave and work becomes a drag. Although there are many opportunities to build your team at work, there is nothing better than taking them out of their normal environment to work together on something different and unique. 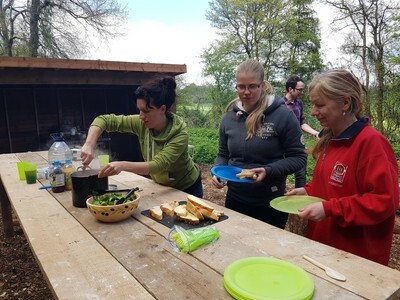 A Woodland Retreat is a truly unique environment in which it appears that you are working with nature and learning new, quite practical skills. However, beneath that there is the more important work of developing leadership, building relationships, understanding the planning, organisation and strategy. Designed as practical and interactive, this experience will introduce your team to key outdoor skills that will require you to listen, communicate, self-manage, delegate and negotiate. 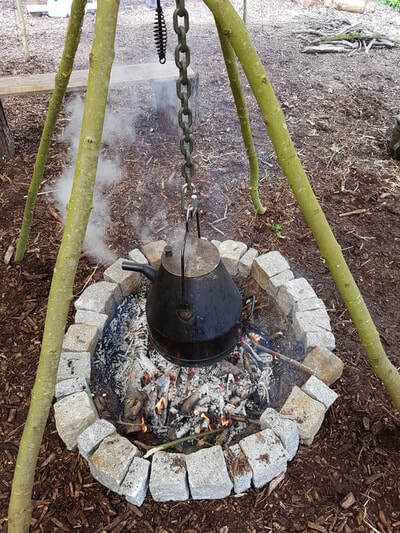 All our experiences are fully catered and provided, with all cooking utensils, kettles, wood for the fire. There are natural ovens, tables stools and places to prepare food. Also, you have compost loos, with the most amazing view and hot showers. 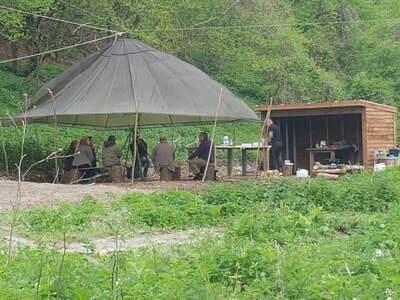 Below is our Itinerary for Wild Glamping and Bushcraft, which can be adapted and booked as a Corporate Event. A two night and two day Wild Glamping and Bushcraft Experience, deep in the woods. Sit out as the sun goes down and watch the stars come out (assuming that British weather is being kind). 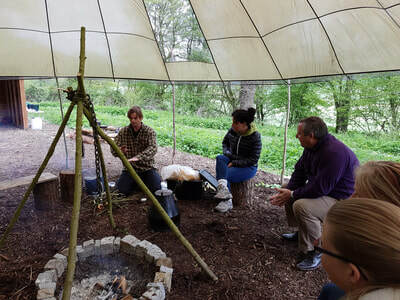 Prepare for the days activities that might include bowmaking, spoon carving, firelighting, foraging or even a nature walk. Activities continue throughout the afternoon, also allowing time for relaxation and reflection. Guide leaves you for a night on your own. Foraging and consuming wild food, without killing yourself. 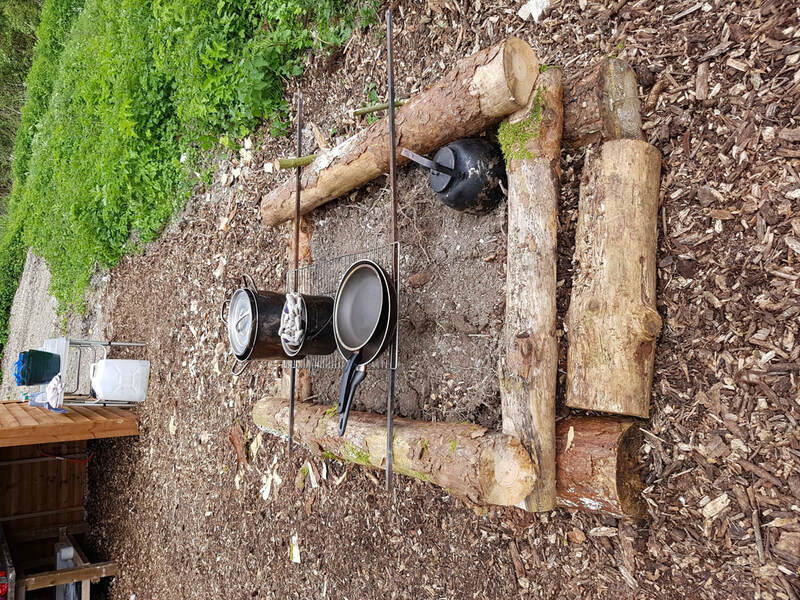 Preparing a delicious meal of "Bushcraft Tucker" (I can assure you that it's not like "I'm a Celebrity Get me Out of Here). Skillful knife-work, without the need for A&E. Making a wooden bow (not that practical these days - but a lot of fun). Surviving in the wild (you never know, this one could save your life). Bushcraft is the art of acquiring information, know how and skills to survive in a natural environment. As well as being useful and fascinating in itself, the approach to learning these skills is transferable. Let me explain. In any new situation, whether it be an unfamiliar business situation, an emergency or even travelling to a new place, the most important thing to be able to do quickly is observe and orientate yourself and/or your team. The first stages of bushcraft are all about observation and orientation. What's safe? What do we have available What are we trying to achieve? Learning this approach will will be useful for life. The second stages of bushcraft are all about leadership, planning, decision making, doing and building relationships with others. What needs to be done? Who's going to do it? What skills do we need? When do things need completion? How are we going to work together? 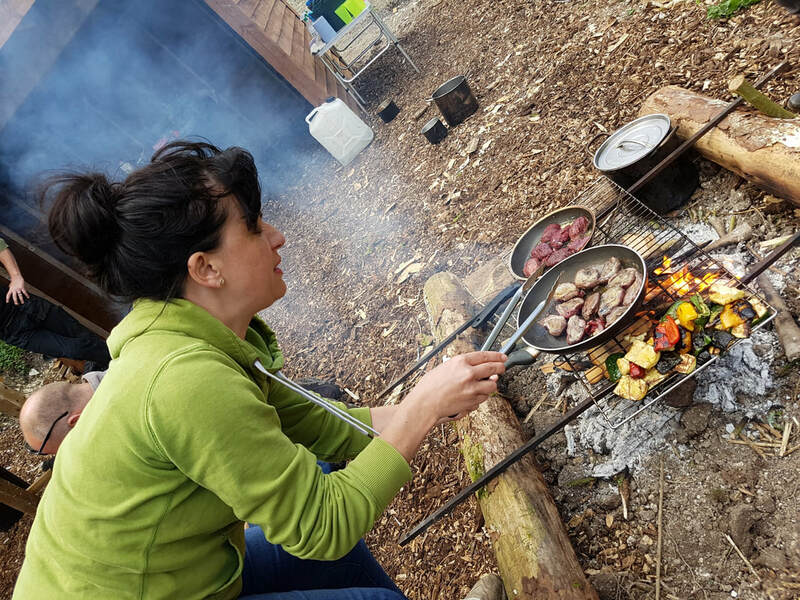 These are essential life skills and management skills, all of which will be honed and developed in a Bushcraft Experience at Meon Springs.